Growing roses? 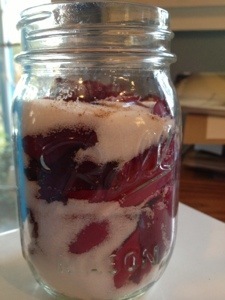 Want a new, special and swoonably amazing way to preserve the sweet scent, flavor and medicine of your favorite roses? Try this Gulkand…a recipe from the Ayurvedic tradition. This sweet confection is not only delightful to enjoy off the spoon- but is heart healing and soothing, calming to hot tempers, cooling to the body on hot days- and delicious swirled into lemonade, whipped cream, into cacao treats and more! Share with your lover for a sweet loving heart opening aphrodisiac! of the jar. Pack it well, but not too tight. It will reduce down a lot! If you wish to add any other spices sprinkle those in between your layers of rose and sugar. Whole cardamom seeds or cloves work well, just a few, or try powdered nutmeg, cinnamon or vanilla beans. Lid the jar well and place in a sunny spot in a window or outside where the roses and sugar will warm up, release their juices and melt the sugar and crystallize together in a mass of gooey rosey goodness. This takes 1-2 days of full warm sun shine. You might want to stir it up a little once the roses and sugar have reduced, and store it in the fridge. Dip in now and again for a rose delight! 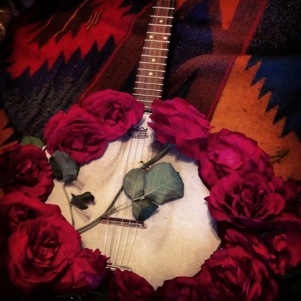 And then again, maybe you just need to give your roses to a neglected friend- like my banjo- who once saved my life- and in the mayhem and madness- got a bit forgotten this past year. Oh my goodness, this look divine! I can’t wait to make some. True herbal magic!